Located in historic Daniels Hill this 1878 Italianate mansion has been authentically restored to its original grandeur. As you drive through the brick and iron front gate imagine visitors exiting their horse-drawn carriages under the porte-cohere, being welcomed in the grand foyer and entertained in the formal front parlor. Not only is this home the largest and finest Italianate mansion in the Daniels Hill Historic District it is the largest Italianate home in the city of Lynchburg. In the spring of 1875, Richard Thomas Watts purchased the two lots on Daniels Hill for the sum of $2,150.00, onto which he erected his residence which took more than two years to construct. 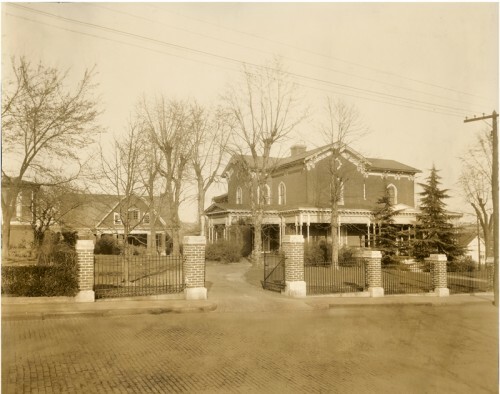 Changes to exterior in 1910. The original main brick mass of the house was trimmed with three frame polygonal bay windows and with two small porches adorning the Cabell Street facade. Six outbuildings dotted the property, with two large frame structures fronting D Street. By 1902, two of the small outbuildings had been demolished, and one of the buildings on D Street was identified as a carriage house. More significantly, the Cabell Street facade of the main house had been renovated, and the Queen Anne porch features that can be seen on the house today had been added. This fine home is of the Italianate style as it resembles a Renaissance villa appropriate for a residence in a city. Predominately a rectangle both exterior and interior walls are constructed of three courses of brick. A compact, symmetrical floor plan features a sweeping staircase in the entry foyer. Rounded romanesque arches frame windows and doors. Pediments, scrolled brackets, pilasters, overhanging eaves and pillars were common on Italianate homes. Queen Victoria adopted this style of home for her residence on the Isle of Wright-Osborne House. Daniels Hill is one the Lynchburg’s seven hills surrounding the original core of downtown Lynchburg. A narrow elongated hill it’s bordered by the James River on the east and Blackwater Creek on the west. Located immediately northeast of the central Lynchburg business district, Daniels Hill proved to be a popular and convenient neighborhood for merchants, business owners, and others wanting to be closer to the commercial district and the James River. According to the Lynchburg News, June 29, 1875 Danielstown or the town of Daniel was named after Judge William Daniel. The Hill consisted of a population of over 600 and 130 homes. In September 1880 the Lynchburg Virginian noted that in another year there will not be a vacant lot on Daniels Hill. During the 1870’s-90’s, Lynchburg’s wealthy merchants built in Daniels Hill. It was an escape from the inner city to the suburbs. With the commercial development of the lower basin merchants could walk or ride in their carriages to work. Some merchants built small homes within Daniels Hill for their workers, most of whom rented the properties. After the end of the Civil War and Emancipation some home owners provided homes to their house staff. In August 1875 the property owners in Daniels Hill met to choose names for their streets and to approve the laying out of new streets. The main street was named Cabell and ran directly up the spine of Daniels Hill. Streets parallel to Cabell were named after locally prominent families. Streets running perpendicular were given alphabet letters. This platting of the streets and the sale of lots plus the building of the new 6th Street Bridge across Blackwater Creek made Daniels Hill perhaps the most actively developed of any of the hill neighborhoods in the 1870’s. The original D Street Bridge (foreground) was a pedestrian bridge. In 1878 a substantial bridge was constructed over Blackwater Creek providing greater accessibility to the community of Daniels Hill. Prior to this date a covered wooden pedestrian bridge existed at 6th Street. In 1878 the first metal bridge in Lynchburg was fabricated by Lynchburg Iron Works, owned by retired General T. T. Munford. The new bridge could fit two wagons across and became a major through fare and a vital link between Commerce and Cabell Streets. Car traffic was removed from this bridge in 1944 but it remained as a pedestrian link until 1984 when the metal began to corrode. The D Street Bridge was originally built in 1884 as a pedestrian walkway. In 1925 it was encased in concrete, one of the original bridges surviving in Lynchburg. Unfortunately the bridge was deemed unsafe in 2008 and was torn down and a new bridge was constructed and completed in 2011. After Daniels Hill reached its peak in the 1880’s it began to decline in prosperity. The creation of the Rivermont Bridge, the advent of the automobile and the construction of the Williams viaduct in 1917, which cut off Daniels Hill from the city, changed the flow of traffic away from the original bridge spanning the James River that connected Cabell Street to US 29 and 7th Street. In 1982 the National Register of Historic Places named Daniels Hill as a historic district. Within the past 10 years Daniels Hill is once again seeing a surge of activity, renovation, refurbishment, and restoration. Walk up and down any street in this historic district and you will see the revitalization taking place. It’s an exciting movement to be a part of! 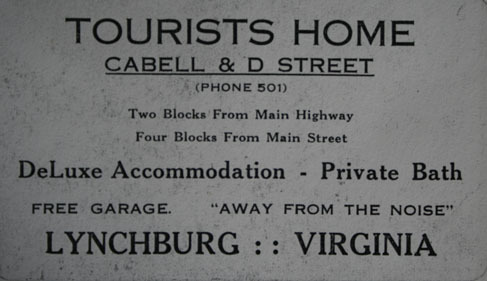 Cabell Street became a residential section of Lynchburg after the Civil War. It was incorporated into the city limits in 1870. Dr. George Cabell Sr. purchased Point of Honor in 1805, 856 acres. Point of Honor was originally owned by the Lynch family. The house received its name from a bloodless duel fought between Colonel Maurio Langhorne and Captain Samuel Wiatt. Dr. Cabell was a prominent doctor who’s most famous patient was Patrick Henry. Dr. Cabell died in 1823 of injuries suffered when his horse fell. William Lewis Cabell inherited the house from his father. He married Eliza Daniel on January 3, 1828. Eliza was the daughter of Judge William Daniel Sr, a judge of the Circuit Court of Virginia. W.L. Cabell died in June 1830. He left the property to his wife, who died shortly thereafter. As they were childless the house went to her father. Architecturally the three commercial buildings at the bottom of Cabell Street define the historic entrance to the hill. Two were early tobacco warehouses associated with an important facet of Lynchburg’s 19th century economy. Cabell Street has a rich variety of architectural styles and housing types dating from the early 19th century through the early 20th century. Concentrated building activity began in the 1840’s following the subdivision of the plantation established by Dr. George Cabell. Providing an interesting contrast to the impressive mansions is the large quantity of vernacular workers houses, built to accommodate laborers in the factories lining the James River. 404 Cabell Street was designed by R.C. Burkholder. Burkholder moved to Lynchburg in 1850 and established himself as a carpenter, mill owner and builder. By 1876 he had become a full-time practicing architect who established himself as Lynchburg’s first professionally-trained architect. He designed seven homes in Daniels Hill. 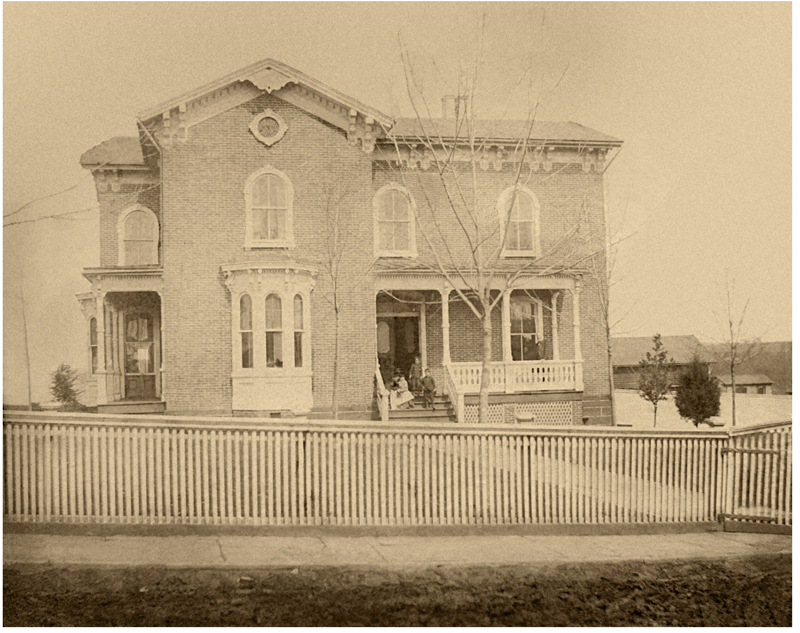 Known as the Watts House it was built between 1875 and 1878. One of Daniels Hill’s most ornate mansions the red brick Italianate was enlarged over the years. The front porch addition, popular around the end of the 19th century, terminates at the north end in a porte-cohere. The elaborate carriage house seen today was constructed in 1909. Surrounded by an iron fence with large brick and stone pillars, the house gives the passerby a sense of dignity and opulence. The original owner of 404 Cabell Street, Richard Thomas Watts was born September 5, 1838 in Bedford County, Virginia. R.T. attended Emory and Henry College in Emory, VA. During the Civil War he enlisted as a private in Company A, Second Virginia Cavalry and joined them at Manassas Junction. He served as a private and color bearer with the 2nd Virginia until he was promoted by General T.T. Munford to take on the responsibility of adjutant with White’s Battalion. Watts held that position until May 6, 1864, when his horse was killed under him and he was wounded at The Battle of Spotsylvania Court House. He was taken prisoner and was sent to Fort Delaware, where he remained as a POW until the end of the war. After the war he partnered with his brother James W. Watts and brother-in-law George M. Jones to form one of the first wholesale houses in the city: Jones, Watts, & Co, a hardware store. The firm held three stores in Lynchburg with branches in Bedford City, Danville, Salem and Roanoke. In 1887 the company was sold to Bell, Barker, & Jennings and Watts retired from the hardware trade. Watts then moved on to other interests, including coal mining and real estate investments. He was vice president of the Lynchburg Trust and Savings Company and director of the Lynchburg Cotton Mill. R.T. Watts died September 21, 1910. R.T. Watts’ will bequeathed the house and lot at 404 Cabell Street, including all of its contents, his carriage and horses, and $135,000 (almost $3 million in 2006 money) to his wife Emma. At the time of his death his total estate was worth over $900,000 or in excess of $19,000,000 in today’s dollars. Emma T. Watts, born July 2, 1849, probably grew up at 314 Cabell Street. R.T. Watts married Emma, on April 22, 1874. R.T. and Emma had eleven children, five who grew into adulthood. Emma Watts died unexpectedly on March 22, 1911 while visiting California. Upon her death, as she died without a will, her five children came to an agreement that Mary Watts, youngest child of R.T. and Emma, receive the house and lot at 404 Cabell Street. She immediately took residence there, later married and raised her family there. Richard Thomas Jr., born March 18 1876 became one of the leading merchants and business men in Lynchburg. He served as President of Watts Brothers Company, Vice President of Lynchburg Trust and Savings Bank, President of the Board of Trade and was interested in many city enterprises. Stephen H. Watts, born August 6, 1877 became a practicing physician and professor of medicine at the medical department of University of Virginia. James Owen Watts born October 14, 1881. His profession was listed as a coal operator. Robert Crenshaw Watts born July 1, 1883. Robert later married the daughter of the United States Senator for the State of Mississippi. Mary F. Watts, youngest child born to R.T. and Emma Watts. Born February 2, 1889 Mary moved into this house upon her mother’s death in 1911. On October 16th 1920 Mary married John Williams James, from Culpeper. They lived in the house until 1928 when they sold the house to Lena Fore. John James worked at Craddock Terry Shoe Company as a vice president for 43 years then at the Peoples National Bank and Trust in Lynchburg. Mary Watts James died on February 2, 1979. Home during World War II was a tourist home. 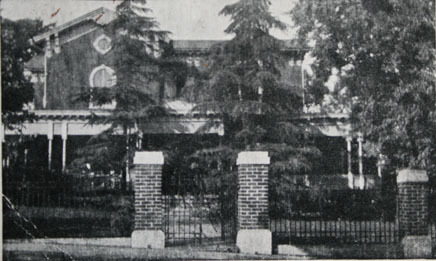 Mary Watts sold the home to Lena Fore in 1928 for $17,050.00. Lena was a successful business person who owned several properties in the City. Lena lived at 404 Cabell Street. Somewhere between 1938-1939 she began furnishing rooms to travelers and the property became known as Cabell and D Street Tourist Home. During World War II Lynchburg was the terminating point for three different rail road lines and literally tens of thousands of soldiers, sailors and marines passed through the City, hundreds of them stayed here on their way to or from the War. By the late 1950’s 404 Cabell Street was once again a single family residence with Lena Fore and her brother living in the property. Leana’s health began to fail and her sister Sallie Fore Tabb became Leana’s guardian and a subsequent chancery court case caused four of Leana’s properties to be sold at public auction in 1961. 404 Cabell Street was sold at public auction on 27 April 1961 for $8,100.00 to Wiley V. and Norma E. Johnson. It doesn’t appear the Johnson’s lived in the property as it was converted into four apartments. According to his heirs he owned several properties on Cabell Street and the Carriage House at 404 Cabell Street was his wood-working shop. When his daughter was old enough to go to attend school they moved from the neighborhood to a house off Rivermont Avenue because the school that serviced this neighborhood was an all black school that didn’t have text books for the students. The home was bought and sold 5 more times after the Johnson’s sold the property in 1984 and on 23 June 2003 Michael and Kathy purchased the property and started the restoration of the home. Fortunately many of the original light fixtures, mantels, doors, and plumbing fixtures remained in the house. They updated the heating system converting the steam radiators to a hot water system and added central air conditioning. Some of the plumbing and wiring has been replaced but there are still galvanized pipes in the house that date back to the late 1800’s. Massive roof repairs were required as there were over 40 buckets in the attic left there to catch rain as it leaked through the roof. Because of the construction of the home (interior walls are three courses of brick thick) the rooms you see today are virtually the same as they appeared over a hundred years ago. Kathy spent numerous hours researching the colors of the late 1800’s to give visitors a glimpse of what it looked like in years past. Most of the doors, door casings, window casings and baseboards are original to the house as is the wainscoting in the foyer, dining room and library. The changes that were made to the structure were minimal as we wanted to try to recreate the house as it was when RT, Emma and their family lived here.